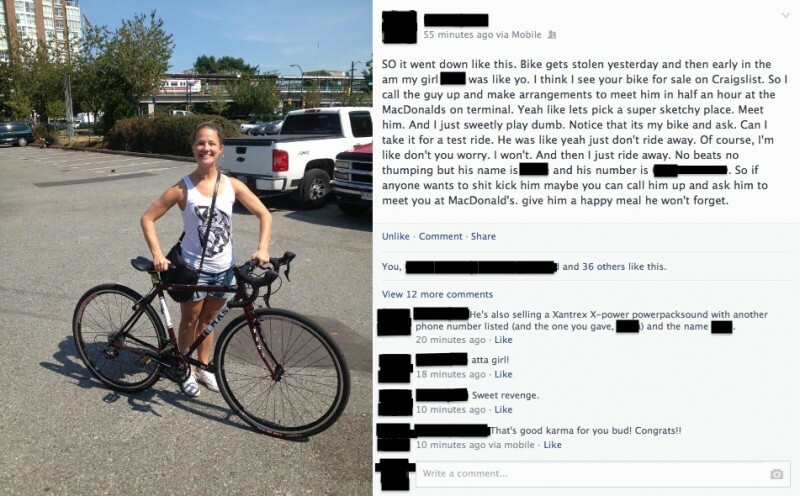 A Canadian girl’s bicycle was recently stolen from her, so she contacted the police. She then saw it for sale on Craigslist and contacted them again, but was concerned that they wouldn’t get back to her fast enough since they said they might not be able to get back to her that day. So, she took matters into her own hands and decided to arrange a meeting with the seller to see the bike. She identified the stickers, asked for a test ride, to which the seller cautiously consented but instructed her not to take off with it. She decided to take off with it anyway and call her friend who was driving for backup. Some may call this theft, and some will call it reclamation, as it is her bike. Later, she checked the serial number and confirmed it to definitely be hers. He has posted from an address that was 2 blocks from where it was originally stolen. Immediately I called the police again and told them the information I received from my friend. The lady told me that someone would call me back and it might not be today. THIS GUY IS SELLING MY BIKE RIGHT NOW!!! I am not missing this opportunity waiting for a call. So I jump into action. I asked the guy if I could take it for a ride around the parking lot. He was weary and said “yeah but don’t take off…” I said not to worry that I would even think of it! My heart was pounding and I had no idea what to do so I just got on the bike and was like **** this guy and started to ride. That is a happy, yet rare ending. Apparently, she also went on to moon Reddit, where she shared the story!